Ricky Stenhouse Jr., driver of the number 6 Blue Bird Ford, won his seventh Nationwide Series victory and fifth of the season Saturday in the 12th Annual Dollar General 300 Powered By Coca Cola at Chicagoland Speedway. 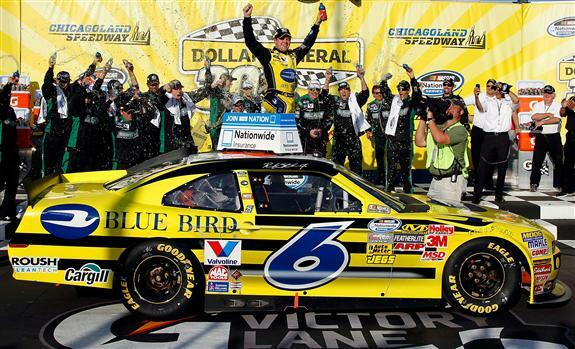 This victory put him into the points lead, nine points over Elliott Sadler. Even though it seems that Stenhouse Jr. has a nice cushion over Sadler, he is still remaining cautious about going after his second straight Nationwide Series championship. “The last four races, I think, we’ve finished second, first, second and first, so I think we’ve got good momentum,” Stenhouse said. “But in this business, in this sport, anything can change at any time. You’ve got to keep your guard up, and you’ve got to keep not making mistakes. The drama of the night remained in the Richard Childress Racing camp, where it was recently announced that Elliott Sadler would be leaving at the end of the season. While Sadler and teammate Austin Dillon were racing hard, “You will not help the 2 car tonight,” was heard over the No. 3 team’s radio. The race featured 17 lead changes among nine drivers, with polesitter Joey Logano leading the most laps with 67. You can view the rest of the results here.